The technological advances in the doll segment continue at a brisk pace: Shortly, we will see the first Robotic Head from DS Dolls, which is going to be veritable quantum leap in this product category. Paul Lumb, founder and head of Cloud Climax – the flagship reseller of the DS Dolls and EX Doll brands for Europe and Great Britain – tells us more about the new product, and he explains why the Robotic head marks the beginning of a new phase in the evolution of the dolls segment. Consumers can now make a down payment on the Robotic Head at your online shop. Does that mean that the launch of the product is imminent? Paul Lumb: Yes, the launch is coming very soon. We are taking deposits of £300 to ensure that our customers are the first to receive the new Robotic Head first. Can you already gauge how much demand there is for this unique product? We have had so much interest and it quite honestly came as a surprise how much. Because this is such a new development in technology from a retailing perspective, I think it really is sinking it for consumers that they really will be able to own a robot. How much will the Robotic Head cost? We have not established how much the robotic head will cost yet, we are taking deposits of £300 which will be offset against the total cost. As usual we will be able to offer fantastic prices to our customers. The Robotic Head clearly marks a quantum leap in this product category. Would you mind telling us more about the individual features of the product? The first generation of the Robotic Head will be able to give facial expressions, movements and will have the functionality to play mp3s. You could play music or a voice recording and it will all be controlled by an App. The second generation will be much more interactive. She will have the ability to speak and interact verbally. She will have a tongue that she can pull out cheekily and may also include an oral function. She will have head neck and shoulder movements and will be a bust rather than just a head. We hope that the functionality will also include the ability to turn on and off your interactive home devices too. How long did it take to develop this product? DS Doll have been undertaking Robotic research and development for around five years. There has been a lot of hard work, which has culminated in the development of the Robotic Head. Research and development into all products is ongoing all the time in the DS Laboratory and they constantly strive to improve all their products in the range. Development is ongoing with further robotic products to be released too. However, this Robotic Head is only going to be the first step. Is it correct that DS Dolls are already working on a new, optimised version? What are the differences between the two? There are several versions of Robotic products that are currently being worked on. 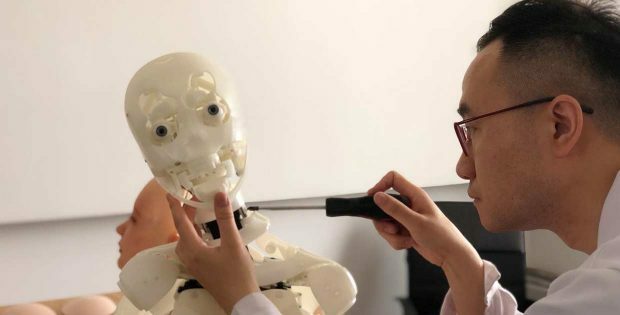 The second generation will improve upon the first by having head, neck and shoulder movements included, being in a bust style as well as being a more interactive version. The First Generation will be fully compatible with existing dolls, which is more unlikely with the second version. Fully autonomous Dolls are being looked into, with much work going into body sensors, warming functions and skeleton and skin progression amongst other things. Which doll models are compatible with the Robotic Head? Or does it fit on any DS Dolls product? The First Generation of the Robotic Head will be compatible with all the DS Doll range from 158cm to 167cm dolls and the Evolution Doll, which is the latest release. The head will fit on any of these doll bodies similarly to a normal doll head. The fitments will be the same. We also anticipate that the Robotic Head will be available on it own with a stand. What can you tell us about the Robotic App? 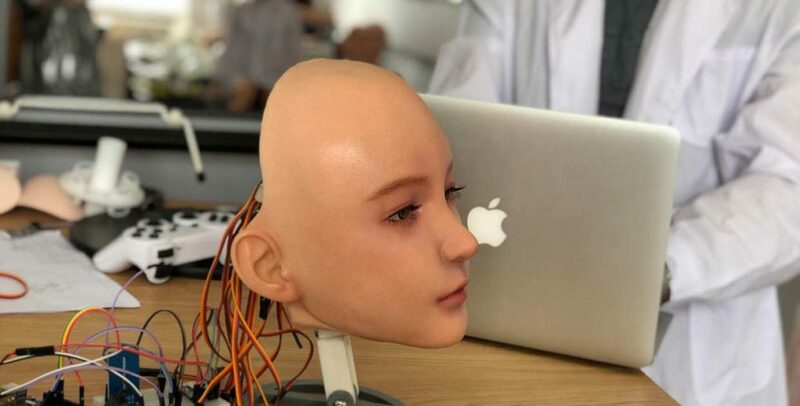 The first release of the App will be a version with the First Generation Robotic Head to facilitate the movement of the face and generation of facial expressions, blinking and movement of the features. Cloud Climax are also working on a more developed version of the app, which will allow users a wider range of functionality and will be available for free to users who purchase their robotic head from Cloud Climax. How much is possible in robotic and artificial intelligence, especially with respect to the adult market? Or, put differently: When will we see the first true ‘robotic doll’? Some people say it will never happen, or not happen for a long time, however I do not believe this. The products are in the pipeline and being developed right now. The technology has got to be right and the market is definitely there for it. The time will come where we will see a fully autonomous doll, with all body movements and walking that is available for consumers to buy. How far away that is, is likely a lot nearer than we might think.